Academy Award winning actress, and co-owner of Rooms & Gardens Santa Monica, Mary Steenburgen. Photo credit, Heidi Ross. “I often sit in this vintage club chair from our store, curled up reading a book with a cup of tea on the green garden stool. We’re always on the search for vintage trays and little accessories.” Said Mary. “One of my favorite things in our store is our Seagrass furniture. It’s beautiful and sturdy and so nice to sit on whether on a covered porch or inside your home. The lantern, candle, and all of the pots are also available from Rooms and Gardens.” Said Steenburgen. “Here is a small settee along with our tea cart coffee table. The pillows in front are from vintage fabric I found at the Paris flea markets. We always have beautiful vintage pillows in stock at Rooms and Gardens.” Said Mary. As you can imagine, Mary has a quite a few Rooms & Gardens pieces around her LA home. When I asked her to choose her 5 favorite pieces, she let us know that “It may or may not be five.” A few days later I had received 5… vignettes! For her first favorite look, Mary chose a Vintage French Club Chair from the 1940’s, with a green drum stool used as a side table, paired with a vintage tray and accessories. “I often sit in this vintage club chair from our store, curled up reading a book with a cup of tea on the green garden stool. We’re always on the search for vintage trays and little accessories," said Mary. Staying outside, we wind our way through her exquisite garden over to one of her other store favorites, a Wicker Tea Cart Coffee Table. The table is from our collection of custom wicker pieces, which his hand-woven by our artisans here in the United States. Like our seagrass pieces, we can customize any table or chair, in any size or finish. Aside from all of our custom furniture, there might not be anything more popular than our pillow collection, which is created from only the finest fabrics, including ikats and vintage textiles. Mary went on to describe the space, “Here is a small settee along with our Wicker Tea Cart Coffee Table. The pillows in front are from vintage fabric I found at the Paris flea markets. 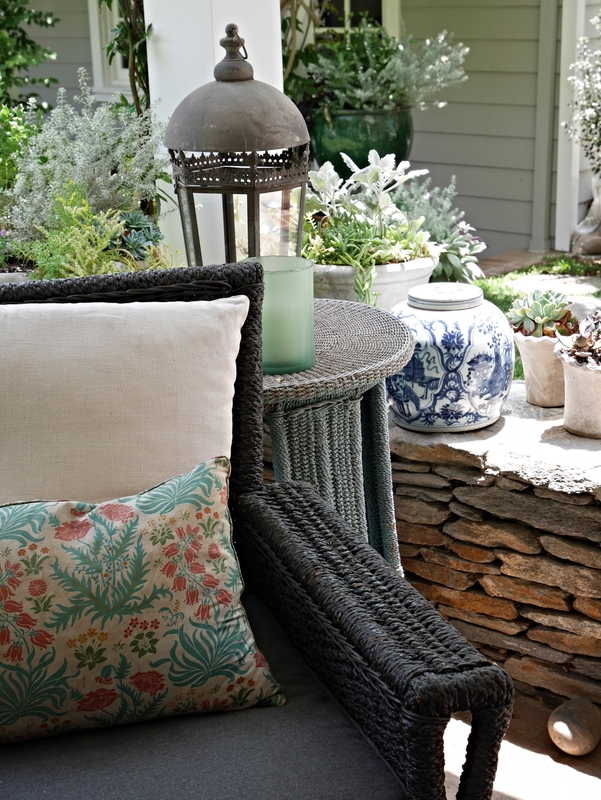 We always have beautiful vintage pillows in stock at Rooms and Gardens." Lastly, we take a look at my favorite of Mary’s looks. An antique bamboo console table that is home to an array of vintage and hard to find collectibles. “When we first opened, I described this Chinese “lucky ball” that I had seen to my partners Eric and Jami Voulgaris. They surprised me the next day by having found the exact thing I’d described and it has been one of the signature gifts in our store. They also discovered a local Santa Barbara artist who makes these beautiful little stained glass dishes, each one individualized with tiny beads. Jami and Eric’s creativity and their unfailing eye for beauty is the secret behind all of the wonderful things at Rooms and Gardens," Mary said in closing.